MyVidster Developer Blog: We are at 67,000 visit a month! We are at 67,000 visit a month! 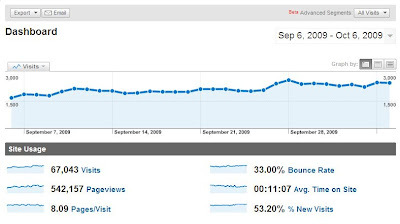 Here is a screen shot from Google Analytics for my recent traffic. myVidster's is still growing! I know that I am behind on development (profile pages), if you include myVidster I currently have three jobs and it is taking its toll on me. If anyone wants to volunteer their programming or marketing skills, feel free to contact me. Wow 2,000 new members! That's great progress in my book! And you will get more exposure eventually. It's only a matter of time, but from the looks of it, it won't be long. You're welcome! And keep posting your progress. I would love to volunteer my programming skills! @Harbor Lit, please contact me @ [email protected] and so that we can talk. I hope that your analytics have education and this data is real. Cause I was learning it in my college. I applied because of my perfect college admission essay I wrote using this site So I think my advice was useful for you! Congrats! You just made it all real and on the other hand I am just playing vlogger go viral & just pretending to be a youtuber. Haha!